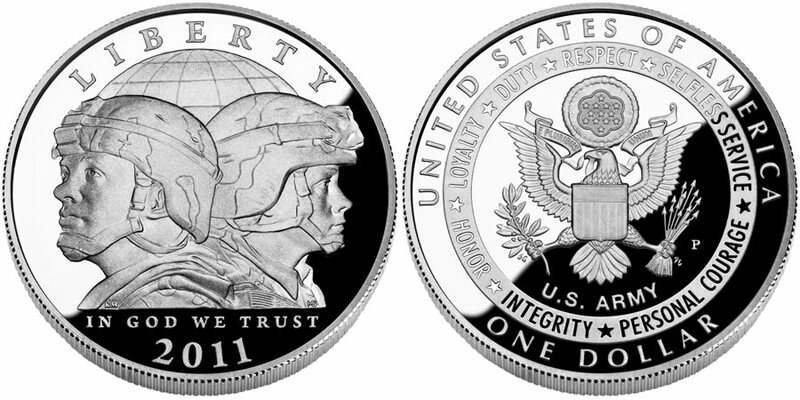 The 2011 United States Army Commemorative Silver Dollar Coin will be released by the US Mint on January 31, 2011 along with two other strikes honoring the nation's oldest military branch. Congress established the US Army in 1775 with the creation of ten companies of rifleman in response to the pending American Revolutionary War. It has operated ever since serving the country in both war and peace. Along with the Army Silver Dollar, the United States Mint will also be striking Army $5 Gold Coins and Army Half Dollar Coins. All three were authorized by the United States Army Commemorative Coin Act of 2008 (Public Law 110-450) with surcharges raised on the sale of each going to the Army Historical Foundation to support the construction of the National Museum of the United States Army at Fort Belvoir, Virginia. Shown on the obverse of the coin is the bust of a modern day male and female soldier, shown back to back. It was designed by AIP Master Designer Richard Masters and sculpted by United States Mint Sculptor-Engraver Michael Gaudioso and also includes the inscriptions of "LIBERTY," "IN GOD WE TRUST" and "2011." The reverse shows the seven core values of the Army - LOYALTY, DUTY, RESPECT, SELFLESS SERVICE, HONOR, INTEGRITYand PERSONAL COURAGE with those inscriptions surrounding an image of the Great Seal of the United States. Also included are the additional inscriptions of "UNITED STATES OF AMERICA," "E PLURIBUS UNUM," "U.S. ARMY" and "ONE DOLLAR." It was designed by AIP Master Designer Susan Gamble and sculpted by United States Mint Sculptor-Engraver Don Everhart.